Ingredients - Get your ingredients from Sweet Treat Supply here! 1. In a large bowl, beat peanut butter, butter and vanilla until blended. Gradually beat in confectioners' sugar and cracker crumbs. Shape mixture into 16 eggs; place on waxed paper-lined baking sheets. Refrigerate 30 minutes or until firm. 2. In a microwave, melt chocolate chips and shortening; stir until smooth. Dip eggs in chocolate mixture; allow excess to drip off. 3. Return eggs to baking sheets. Refrigerate 30 minutes. 4. 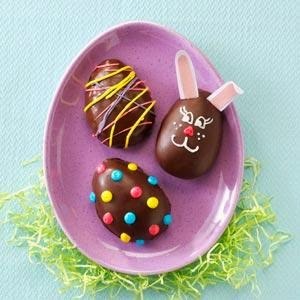 If desired, decorate eggs with icing or other delicious toppings. Let stand until set. Store in airtight containers in refrigerator. Makes 16 eggs. Confectioners' sugar icing: In a bowl, mix 2 cups confectioners’ sugar, 4 teaspoons corn syrup, 1 teaspoon almond extract and 1-2 tablespoons milk until smooth. Tint with paste food coloring if desired.Yield: 2/3 cup. To decorate eggs with bunny ears: Cut decorative paper into bunny ears. Tape each ear to a toothpick; insert into top of eggs. Remove ears before eating. Great fun to make it a family activity or a very special surprise for all in the family. All the ingredients for this EASTER recipe can be ordered today at Sweet Treat Supply!